Colombia is home to about 20% of the world’s birds. The bird immortalized in painting and sculpture around Cartagena is the Maria Mulata. A medium-sized bird of iridescent black or brown, Maria Mulata is neither blackbird or raven. Maria Mulata’s official name is the great- tailed grackle (Quiscalus mexicanus). Clothing should be practical and aesthetically pleasing. In Cartagena, the available options meet that criteria and more. Here, clothing flows and the textures and patterns make it fun to wear. It’s a gray morning in Cuenca – one of the few we have had. It’s also a sad morning, as our program host will be coming with a taxi about 7 to take us to the airport to start the journey home. As we share our last breakfast in the apartment (our favorite – a fresh fruit medley, pastry, milk and coffee, today made even more special by sharing a piece of tres leche cake left from the day before), we discuss how profoundly sad we are. But we knew this day had to come. Staying in Cuenca wouldn’t be the same – after all, the apartment has been sold, our fellow travelers (now friends) are heading back home, and even one of our teachers has been laid off from the school. So it was time to leave. Could we live in a foreign country? Yes. While we did have some structured experiences throughout the trip, much of the time we were on our own. We negotiated in stores, found addresses, tried new restaurants, and saw amazing sites. The more time we spent in the country, the easier it was to navigate daily life. With more time, practice, and improved language skills, we would have a great living experience. We only had one time when we had to ask our program host for interpretive help. Sherri had arranged to have a lovely blazer made to her specifications – two button, hip length, pockets – like one she purchased years ago and has worn out. When she went back for the fitting, a different seamstress waited on her and we couldn’t understand what she was saying. Program Hostess Christine came to our rescue, and found the seamstress was saying her associate had only measured for the fabric and didn’t take specific jacket measurements. After some quick measurements, we were done. By the way, the blazer is amazing and professionally done, all for $25 for the fabric and $45 for the labor. Would we want to live in a foreign country? Some ruins are remnants of the past and stand as a historical reminder of people who once lived here. 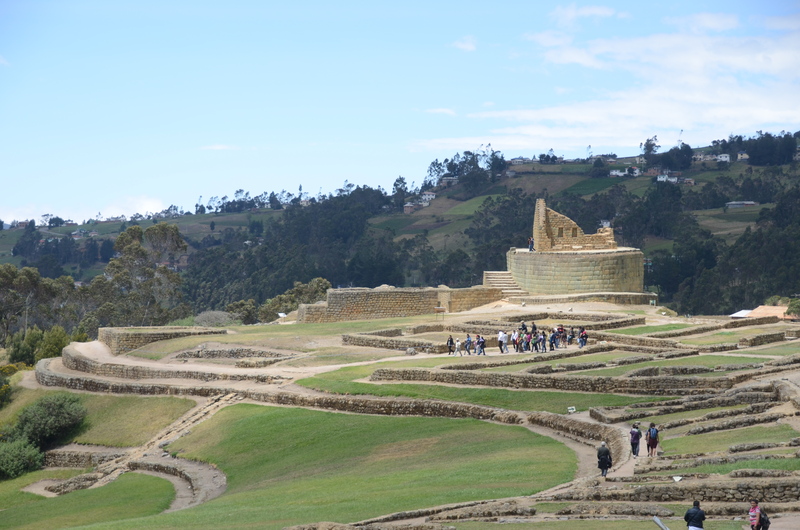 Ecuador’s largest and best preserved archaeological site, Ingapirca, means Wall of the Inca in the Cañari language. This special place was first used for worship by the indigenous Cañari. It was called Cashaloma or Place Where Stars Pour from the Heavens. People of the Americas have a long pottery-making tradition, predating the European arrival. The oldest known ceramics were found in communities along the Ecuadorian Pacific coast and were made 5,000 to 6,000 years ago. The time-honored process is still essentially the same. Dig up some clay, mix it with water, form it into objects and fire it in an oven or kiln. We’ve talked about the wonderful fruit and vegetable markets in Cuenca. However, many of the items are different from what we would find in the United States. Today Two Who Trek looks at some of the unusual fruits we discovered in the markets. Several important Inca-era ruins are in the Cuenca area. Two Who Trek took a bus trip to see one of these, the Baños del Inca (Inca Baths) at Coyoctor. The Baños del Inca is a smaller but no less historically significant archeological site, compared to others in this part of Ecuador. UPDATE – 1-23-2013 — Two Who Trek attended a presentation yesterday and found there are many more Christmas-related celebrations. For example, Cuenca holds a Christmas parade that is over 8 hours long. Plus there is the Festival of the Wikis (no, not information sources. In this case it is a native word for tears) that starts three days before and ends three days after Christmas. Daily celebrations occur on the twelve days following Christmas.